Fellow fans, May is here and the city of Houston is buzzing with anticipation as we’re only a week out from Comicpalooza! Here at Fanspeak Files, Bekah and I mark our calendars months in advance and await the weekend with bated breath. Giant lego statues? Check! Cool cosplay? Check! Fantastic celebrity guests, informative panels, and inspiring artists? Triple check! 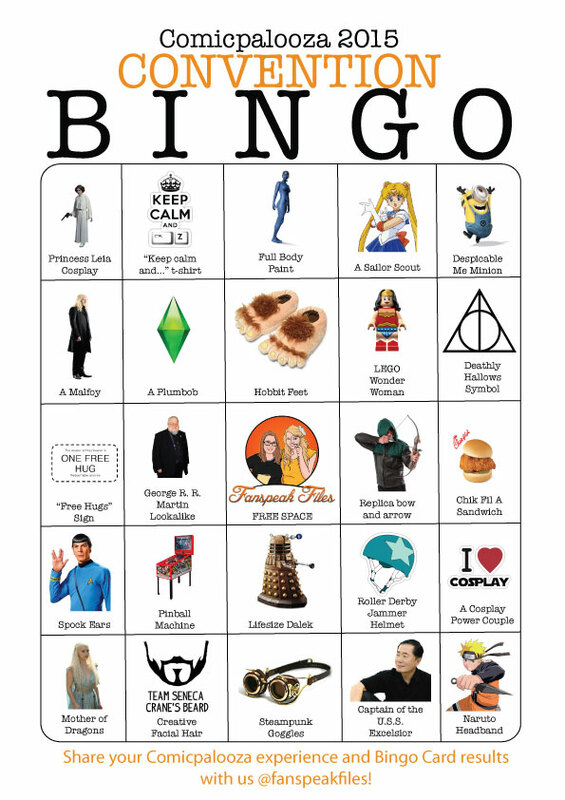 We expect nothing less for 2015, except this time Bekah and I will be armed with our handy Comicpalooza Bingo Card to document the fun. We invite you to download the card and join us on this visual scavenger hunt to commemorate your Comicpalooza experience. Be sure to take pictures, tweet us @FanspeakFiles, or share your favorite parts of Comicpalooza 2015 with us in the comments below. We can’t wait to see you at the Con! What a cute idea! Wish I could make it down there for the con myself.